Enjoy nourished and radiant skin with Nutriglow Power of 4 Facial Kit that gives you glowing & dazzling skin instantly. 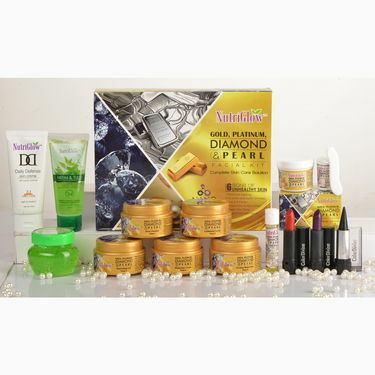 The kit includes cleanser, exfoliating scrub, nourishing gel, whitening cream, mask pack and serum instantly. The unique professional treatment at home cleanses skin pores, removes impurities and fades blemishes from deep within. It also helps in detoxifying and building skin immunity to fight against pollution. 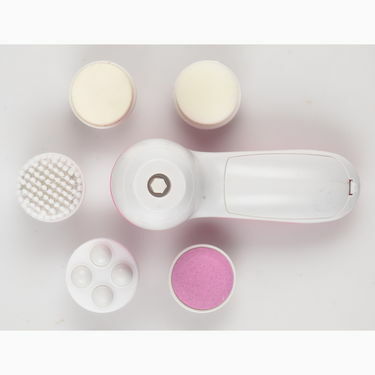 The 5-in-1 massager with the kit leaves your skin hydrated, soft and nourished all day. - Makes Skin Instantly 2 Shades Fairer. Awsome very good product. It makes my skin glow instantly, removed dark spots and pimples and the effect stays for a long time. Nutriglow Power of 4 Facial KitVSNutriglow 21 Pcs Dhamaka Facial K.. Nutriglow Power of 4 Facial Kit VS Nutriglow 21 Pcs Dhamaka Facial K..
Nutriglow Power of 4 Facial KitVSNutriglow Double Dhamaka Facial C.. Nutriglow Power of 4 Facial Kit VS Nutriglow Double Dhamaka Facial C..
Nutriglow Power of 4 Facial KitVSNutriGlow Diamond Facial Kit with.. Nutriglow Power of 4 Facial Kit VS NutriGlow Diamond Facial Kit with..
Nutriglow Power of 4 Facial KitVSKremlin Complete Beauty Combo + F.. Nutriglow Power of 4 Facial Kit VS Kremlin Complete Beauty Combo + F..